In our attempt to not waste as much food, Steve and I have started eating more salads…which is a good thing right? Packed with vitamins…and if we didn’t pile on the cheese they’d probably be considered healthy too. Yep, Steve will eat beets!!! And he doesn’t gag when I serve them anymore. 2 servings as entree or 4 servings as a side. 1. Rinse your beets well before adding them to a large pot of boiling water. Boil the beets until they are fork tender, this could take anywhere from 25 minutes to an hour (maybe more) depending on the size and freshness of your beets. 2. While your beets are boiling prepare a second smaller pot of boiling water. In this pot you will add your green beans. Boil them for 2-3 minutes until bright green then strain them and add them to an ice bath to stop the cooking process. 3. Once your green beans are cooled cut them into 1-1 1/2 inch segments and set aside. 4. Once your beets are tender, strain them in the sink. I’ll usually run a little cold water over them and put a handful of ice cubes on them to speed up the cooling process. Once they have cooled you can peel them and dice them up. 5. Drizzle your beets with a little red wine vinegar while you prepare the dressing. 6. To make the dressing combine EVOO, red wine vinegar, mustard, honey, minced garlic, and minced shallot in a small bowl and whisk until blended. 7. Toss the beets in a tablespoon or two of the dressing. 8. 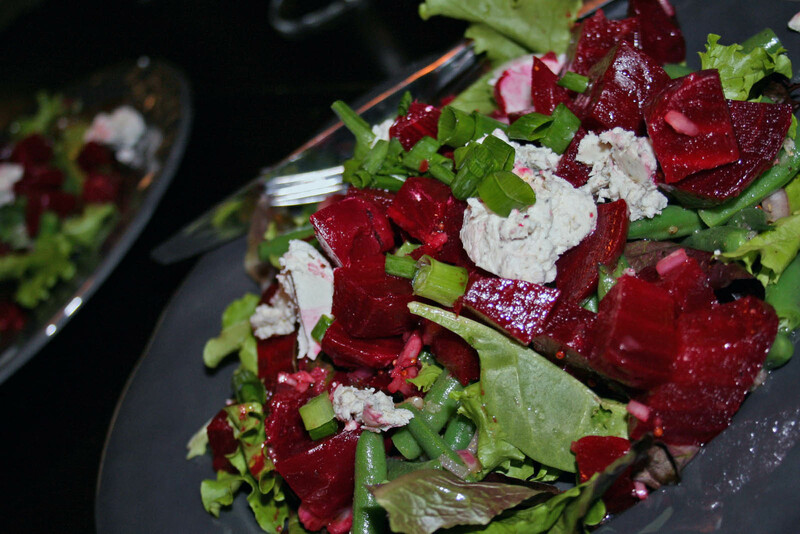 In a large bowl toss the salad greens, green beans and dressing until covered, then serve the salad greens on small plates and top with the beets and goat cheese. Garnish with some of the diced green onion. This entry was posted in Eat, Salad and tagged beets, dinner, diy salad dressing, goat cheese, green beans, greens, healthy meal, lunch, salad by autumnadams4. Bookmark the permalink.